"This dessert is simple and refreshing and great for an easy summertime treat. Garnish as desired." Pour reserved mandarin orange juice into a measuring cup. Add enough water to make 3/4 cup. Bring juice mixture to a boil in a saucepan. Pour orange-flavored gelatin into a small bowl. Stir in boiling juice mixture until dissolved. Chill until slightly cooled, about 10 minutes. Stir orange soda gently into gelatin mixture. Measure out 1/2 cup gelatin mixture into a bowl. Whisk in whipped topping until smooth. Pour into crust. Refrigerate crust until topping is cool, about 15 minutes. 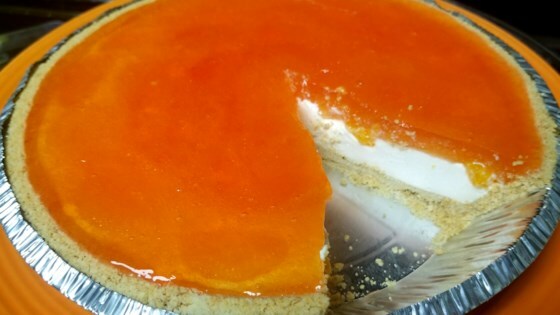 Arrange mandarin orange segments on top of the crust. Chill again, about 10 minutes. Spoon remaining gelatin mixture over the orange segments and refrigerate until firm, about 3 hours. This is a simple and fun recipe, great to make with the kids!